What could be more awkward than a vegetarian at a steak convention? 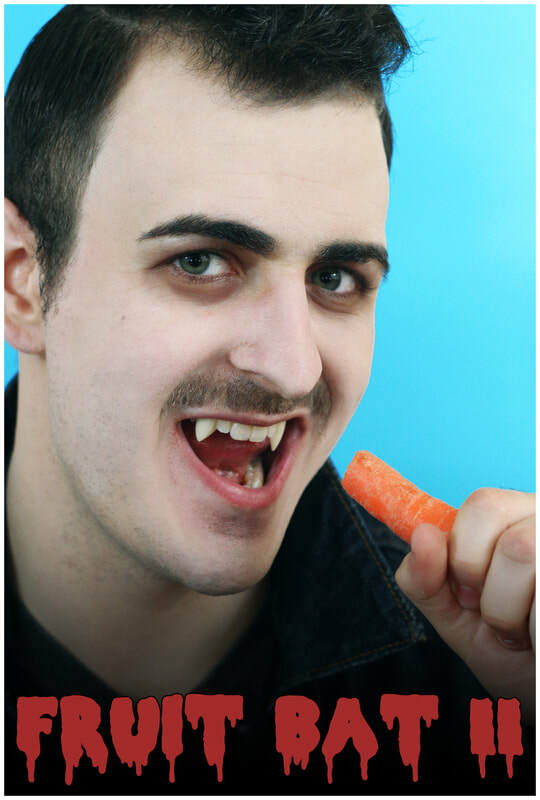 How about a vampire, who decides on a fruit or vegetable over blood? This is the premise behind "Fruit Bat II" as it promises a bunch of laughs, in a short period of time. After watching this title, two things were quite clear. The first was that conceptually, this was a "great" idea. The second thing? The mixing of splatter-house horror and straight up comedy didn't always hit me right in the jugular - but always managed to keep things neck level. Overall, I can easily admit that I was amused enough to consider this title a success. However, the feeling that I had stumbled into a scene from a larger film, kept itself larger than life throughout. You may notice that this film is called Fruit Bat 2, yet I could find no Fruit Bat 1 - only a vague reference to another appearance of the 2 main characters - in some far off land. But yes. There were successes here. The overall quality of the production far surpassed that of a "Youtube" video, as I was secretly expecting. The characters were presented and acted well. Hell - even the props and splatters of gore here and there were all great! The entire film however, just felt unfinished. Like a promise never kept. If this title was presented as a series of sorts, with more to come, perhaps my expectations would have lessened. No such luck. This is presented as a short film; but my hopes are that maybe more of the story will eventually be explored. I have no problem writing that this title plays well. It just let me down with the promise of a larger story left unfinished. If that day comes, I would be more than a little excited to revisit this title and revise this extended blurb. Since this title is available to watch and completely free... why not check it out for yourself? With a length of around 5 minutes - why not?